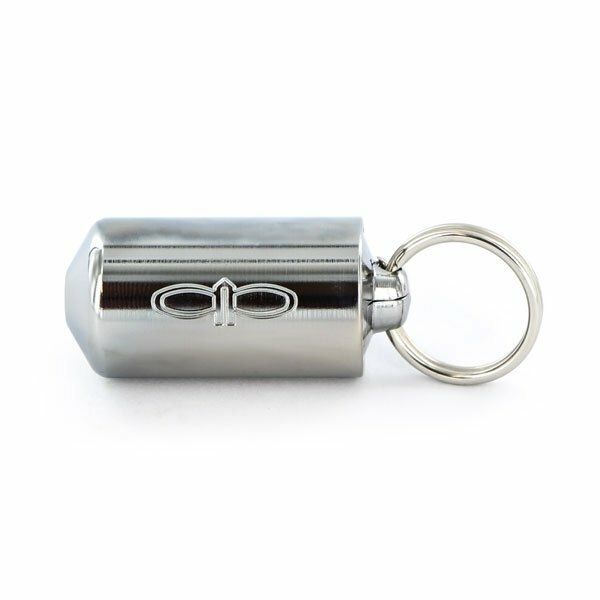 La Pipe en Métal Piece Chrome est une pipe usinée avec précision qui s'attache facilement à votre porte-clé. Elle a remporté le prix de l'innovation à la 7ème Cannabusiness Internationale. 3,5cm de longueur, ressemble à un gros pointeur laser. Séparable en 3 parties pour un nettoyage facile. 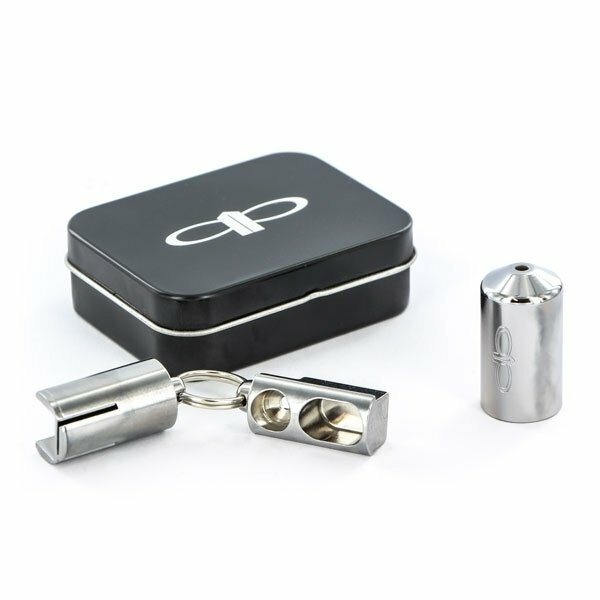 Ce gadget solide (60g) est fabriqué en inox, finition chrome. Garantie à vie. I'm really happy with this pipe. Delivery was super fast (to France), and nicely packed. The pipe is really solidly and nicely made with no burrs or sharp edges, and nice positive clicks for opening for a smoke and at the stash compartment. Closure also feels secure. It's also very discreet with no indication of what it is on the pipe other than a non-identifiable logo. The tin would equally be non-identifiable, if it didn't have the pipe's website printed on the bottom of it. Beware that on unpacking you will find the inner sections are covered in packing grease, so you need to give it a good clean before lighting it up. It will taste like crap if you don't give it a good clean with something alcoholic or using (like I did) a sanitizing hand wipe or two. Not that it needs sanitizing, they've just got alcohol and they cleaned off the grease really well. I guess the grease is essential to keep it in good condition after manufacture, so I'm fine with that, as well as the cleaning I had to do. The pipe doesn't roll around when you're loading it, and I found the end ring really handy to have a hold of the pipe when I'm smoking. Much better than holding the body of the pipe. The only down-side I can find is you're never sure which way is up, if the pipe is loaded and closed. The orientation of the ring tells you it's either the right way up or completely upside down, but there's no other indication. I found the only work around on this was to keep the logo aligned to the bowl side to give a visual cue on this. Smoking is great. Cool enough despite the pipe's small size. I haven't experimented by leaving it in the freezer for a while to give a total cool smoke yet, but I will. I also bought the 'VaporGenie Classic Screens - 10 pcs' - Diameter: 15.8mm (item ref: HSVS0091), and they're a perfect fit, and they fully line the bowl with no trimming necessary. Just fold them in to the bottom of the bowl with the end of a pen, and you're good to go. In all, a really nice pipe. Really happy with it.